Alexander Lernet-Holenia, Mars in Aries, Trans. by Robert Von Dassanowsky and Elisabeth Littell Frech , Ariadne Press, 2004. A masterwork and one of the most strikingly unique and sophisticated novels in twentieth century German language literature, 'Mars in Aries' was immediately banned upon its publication in book form in 1941. Although this story of a romance between an aristocratic Wehrmacht officer and a mysterious woman in Vienna set against the 1939 invasion of Poland was deemed unacceptable fare for Third Reich readership due to its ambiguity, lack of heroic military images, and the sympathetic portrayal of a suffering Poland, the novel's actual purpose and highly subversive quality were hardly suspected by the Ministry of Propaganda. As Alexander Lernet-Holenia's (1897-1976) Mars in Aries had received magazine serialization but was immediately banned upon its publication in book form in 1941 (republished in 1947 based on a found manuscript proof). Although this story of a romance between an aristocratic Wehrmacht officer and a mysterious woman in Vienna set against the 1939 invasion of Poland was deemed unacceptable fare for Third Reich readership due to its ambiguity, lack of heroic military images, and the sympathetic portrayal of a suffering Poland, the novel's actual purpose and highly subversive quality were hardly suspected by the Ministry of Propaganda. Richly constructed with cultural, historical, literary, linguistic, philosophical, and metaphysical references that counter Nazism and expose the premeditation behind the attack on Poland, the novel suggests the survival of Austrian identity, the intermeshing of existentialism and fate, the duality of existence, and the qualities of resistance. Written with great formal elegance, subtlety and humanistic erudition, and presented here in its first English translation, Mars in Aries is a standout among war and resistance novels. It also underscores Alexander Lernet-Holenia's place in the Austrian literary canon alongside such writers as Schnitzler, Hofmannsthal, Musil and Broch. 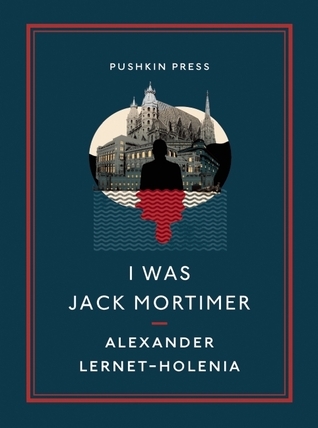 Alexander Lernet-Holenia, I Was Jack Mortimer, Trans. by Ignat Avsey, Pushkin Press, 2013. A taxi-driver in 1930s Vienna impersonates a murder victim-with unsettling consequences. "One doesn't step into anyone's life, not even a dead man's, without having to live it to the end." Twice filmed, I Was Jack Mortimer is a tale of misappropriated identity as darkly captivating and twisting as the books of Patricia Highsmith. I Was Jack Mortimer only covers a few days, but in that time Ferdinand Sponer experiences considerably more than he could have ever bargained for. Sponer is a taxi driver in 1930s Vienna, and the novel begins with him becoming entranced by a fare -- so much so that he basically stalks her. Marisabelle von Raschitz is of a different social class and certainly not too excited about the attention she suddenly receives from this cabbie, but Sponer can't help himself. And this despite the fact that he has a longtime girlfriend, the devoted Marie Fiala. But it's another fare that turns Sponer's life upside down -- Jack Mortimer. Mortimer gets in Sponer's taxi at the train station, and asks to be taken to the Hotel Bristol (failing to specify whether he wants the Old or the New one); it's all downhill from there. Sponer's judgment isn't the best, and in his panic -- he has good reason to panic -- he takes some unfortunate steps (though admittedly even as he tries to do the right thing early on he is stymied by circumstances around him). Eventually he decides his best bet is to check into the Bristol as Jack Mortimer and play the role for a night, after which he thinks he can slip back into his old life, with no one the wiser. It doesn't work out that way, of course, as Mortimer also becomes: "the demon in Sponer's head". It turns out Mortimer comes with more baggage than just his suitcase, and no sooner has Sponer checked in than someone wants to arrange a meeting with the person they believe to be Mortimer -- and they won't take no for an answer. Mortimer's own backstory is eventually revealed, and it puts Sponer in what looks like a hopeless position. He turns to faithful Marie for help, and she is willing to do anything for him, but by that time the police are already circling and Sponer can feel the noose tightening. Yes. You’re now free, you say ! You’re no longer what you were ! Which, as it turns out, isn't what at least one person wants from him. But, by the end, everything is back in its proper place: justice has been served, and the social order restored. Sponer hurried down Burggasse alongside the rumbling and clanking carts, then turned right onto Lastenstrasse, which was equally busy. Only at Karlsplatz did he turn off, and the clatter and rattle died away in the distance. From Sponer's stalking to his desperate attempts to unload Mortimer to the chases and confrontations with the police and Mortimer's past catching up with him, there is some decent excitement here. It's quite a well-paced thriller -- over-stretched on occasion in the streets of Vienna, and with some inadvertent comic moments to (such as the scene where: "without any hesitation he socked them over the head with his rubber truncheon"), but quite enjoyable. Both the initial disaster and the way things neatly work out are perhaps all a bit too neat, but it's amusing to see how Sponer flails about and things just move ahead regardless of what he does. The social class conflict element is a bit odd (and that resolution also a bit much for the story to handle), but it's also an amusing side-story. Alexander Lernet-Holenia, The Resurrection of Maltravers, Trans. by Joachim Neugroschel, Marsilio Publishers, 1989. After waking from apparent death on the floor of the family crypt, Georg Maltravers resolves to live a second life under an assumed name. Kafka, Rilke, Hugo von Hofmannsthal and Karl Kraus are just a few of the major creative figures who emerged from the ruins of the Austro-Hungarian Empire. And now, somewhat belatedly, the name of Alexander Lernet-Holenia (1897-1976) must be added to the list, given the re-emergence in print of two previously translated Lernet-Holenia novellas, ``Baron Bagge`` (1936) and ``Count Luna`` (1955), and the first appearance in English of his novel ``The Resurrection of Maltravers`` (1936). ``time and space . . . between dying and death itself.`` If the latter suggests the vagueness of a seance, be advised that making that interval utterly concrete is one of Lernet-Holenia`s chief goals-not because he wants to make the reader`s flesh creep but because he seems to believe, perhaps even knows, that the interval is fact. ``Maltravers`` the aged title figure, an aristocratic con-man and rogue who has been briefly entombed after his apparent death, comes to his senses, adopts a new identity and proceeds to make his mischievous way through the world once more. The eponymous narrator of ``Baron Bagge`` speaks of a World War I cavalry expedition into Hungary, where, after a reckless assault on a Russian detachment, the Baron and his comrades can find no further enemy forces and are welcomed by the populace with lavish hospitality-in the midst of which the Baron comes upon the love of his life. And in ``Count Luna`` an industrialist inadvertently responsible for sending a man to a concentration camp feels certain that the fellow has survived the war and is mounting a shadowy campaign of revenge. What no summary can convey, though, is that plot is where the lyrical or poetic element of Lernet-Holenia`s fiction resides; like Kafka, whom he otherwise does not resemble, Lernet-Holenia weaves his most intimate hopes and dreams into the texture of what happens next. Alexander Lernet-Holenia, Mona Lisa, Pushkin Press, 2015. Three things have led the young nobleman Bougainville to his great, tragic love: war (he went to fight the Spanish for his king), art (his army visited Florence to do some light shopping) and the humble housefly (which he was chasing through Leonardo da Vinci's workshop when he stumbled upon her, leaning on an easel hidden behind a curtain). He is plunged into an amour fou for his Mona Lisa - too beautiful, too real to have been imagined, however great the artist - and his attempts to find her prove wild, violent, even fatal. Lernet-Holenia's novella is the brilliantly funny story of how art inspires a tremendous love - pure, for all its madness - and is inspired by it in turn. Alexander Lernet-Holenia's Mona Lisa, nicely packaged in a small volume by Pushkin Press, is hardly a full-fledged novel (or even novella); it's barely more than a story -- but appealing enough as a small, historical trifle. Mona Lisa begins with Louis XII of France sending off a force on a second Italian campaign in 1502, led by Marshal Louis de la Trémoille; among his entourage is a Philippe de Bougainville. Spoils of war are harder to come by in this second campaign, and La Trémoille decides: "to concentrate on the purchase of objects of art" -- leading him, in Florence, to the home of Leonardo da Vinci. It is Bougainville who glimpses the unfinished portrait of Mona Lisa there, and though Leonardo demurs -- "It is woefully unfinished. It's a mere trifle" -- Bougainville is bewitched by the image of the woman captured by the painter. He had no end of projects on the go, practically all of which he later abandoned to preoccupy himself with anything that took his fancy, rather than with the matter in hand. Perhaps he realized that in truth nothing could ever be accomplished fully. It is certain that nothing, or almost nothing, is ever accomplished to the end, and the little that has been may, in the last analysis, be a delusion. (D)espite my efforts to capture it, the smile of this woman has eluded me. Every smile is a mystery, not only of itself, but in every other respect too. But I have no clue to this mystery. Bougainville becomes obsessed -- and convinced that the sitter of the portrait is not, as everyone claims, dead. He goes to considerable lengths to convince himself she is still alive -- and is determined to save her. Things get out of hand, and do not go well -- but Leonardo finds his missing inspiration, the final clue to the mystery that had baffled him.